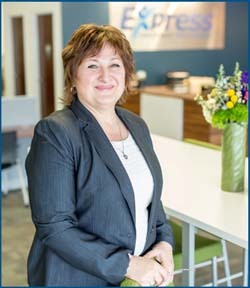 Lorraine Medici joined Express Employment Professionals in 2014 as the Director of Training and Development. Lorraine has extensive experience as a coach and workshop facilitator in the areas of leadership and teambuilding, working closely with companies to strategize solutions that will impact long-term results in engagement and retention. She has successfully launched Purpose-Driven Leadership Training, a series targeted at helping develop managers and leaders at all levels in manufacturing and other industries. She is also an approved Training Partner with the Human Resource Certification Institute (HRCI). She is an Associate Certified Coach and Master Practitioner for the ELI (Energy Leadership Index) Assessment. Lorraine is also certified in DISC and Emotional Intelligence training. Lorraine has extensive experience as a personal development coach and workshop facilitator in the areas of leadership, teambuilding, and sales.